Seeing that there was no topic for the discussion of where to buy legitimate Sailor Moon merchandise online, I decided to make one to help anybody who is interested in researching their options before making purchases with an unfamiliar merchant or store. Although the primary focus of this topic will be to discuss and review places/merchants that members have already purchased from, any discussion regarding bootleg identification or shopping tips is perfectly fine and encouraged! **Just a friendly reminder to be constructive with the reviews meaning that if there was something you thought the merchant needed to improve on, feel free to mention it, but don't forget to mention the things they did a good job with! **If a merchant is already listed, but you would like to share your experience with them, please do! It is okay for us to have multiple reviews for the same merchant. P.S. If anybody has any other ideas for this master post or thread, do share! +Items may take months to arrive if you pre-order something with in-stock items and forget to specify when or how you want the items shipped. +You might need to add their customer service e-mail to your address book in order to receive their updates on your order status. I've seen a lot of people here in the forums wondering how to get the new merch from Japan that isn't eBay (because you can't be sure about bootlegs) or Crunchyroll (which sends out the merch much later than anyone else). So because I do this on the daily, pretty much, I thought I'd put together a really basic quick guide! 1. keep an eye on Sailor Moon Collectibles. 2. if you don't speak/read Japanese, check English shopping sites first. unfortunately, a lot of the English shopping sites don't have a ton of overlap for what they end up carrying for SM merch, so I usually have to go hunting across all three sites that I frequent. also, the benefit of sites that are more shopping sites than deputy services is that shipping logistics are a lot simpler for the customer. your best bet for a reasonable price is CDJapan; you can amass points with each purchase to eventually offset the price of something big you want, they tend to have a big selection, and they don't charge a lot of overhead. J-List also has a huge selection and a points system, but their overhead is much larger. try CDJapan first. AmiAmi is similar to CDJapan, but they don't tend to have as big of a selection. 3. if not, From Japan. From Japan SMC's recommended deputy service, and the one I use as well. the best part is that it's VERY easy to use. the downside is that you might need to be able to search in Japanese, with Japanese type, and Japanese words. SMC already has a pretty quick and easy guide! she tends to not have the item names in Japanese, so unfortunately if you're looking for a specific item and it's not on Premium Bandai, it might be difficult to figure out how to search for it. luckily, most items are listed on Premium Bandai even if they're sold out or no longer available, you can just search 'sailor moon' (if nothing else, grab the japanese text from the wikipedia page!) and search through for the item(s) you're looking for on PB, grab the item name from its page, and then enter that in FJ's search! IF YOU'RE GOING TO SIGN UP FOR FROM JAPAN AS A NEW MEMBER, PLEASE LET ME KNOW! if you PM me with your email, I can send a recommendation to you and we both get 300 points! 4. did From Japan reach Premium Bandai's order limit? here's another option! some other Sailor Moon friends of mine recently turned me to No Country for Tall Men Exports, which, as far as I can tell, only functions off of Facebook. ALSO as far as I can tell, it's just one guy! I only have one preorder with him so far, but he's been professional and fair - my friends have been customers of his much longer and only have good things to say! this might be an easier option if you don't speak/read Japanese and don't know how to find an item you're looking for, since this is a real live person who might be able to bridge the translation gap and help you out! I'll try to add to this if I think of anything else, but definitely ask any questions if I wasn't clear! OH I'M SORRY!!! I didn't see a post, I checked.......... I must have missed it or misunderstood by title??? should this get deleted? @sammywhatammy If you have a better idea for the topic name, we can change it! I just wanted to throw the topic up before I forgot how it would be organized hahaha. Perhaps the title should include "list" in it as well? @Tuxedo Mistress Yay! I can't wait! I have a general question regarding forum mechanics. Do you know how to link posts in a thread together so that if somebody wrote a guide on page 3 for example, we could jump to that person's information from the master post instead of scrolling through everything just to find it? Comments: They have very good price, but the keychains will always come mixed, so you may get three Usagis, two Amis, one Rei, one Luna and Artemis, one Makoto and no Minakos. That's the downside. But it's super worth it! Item(s) purchased: So far, a trinket for my phone, S.H. Figuarts Sailor Chibi Moon and I've bought a Cutie Moon Rod PROPLICA for my website. Comments: Items will always come in a very good package and they are very respectable. Highly recommended! Comments: My Sailor Jupiter pen came broken =( But its shipping is VERY fast. Comments: Not so expensive and their fast shipping is awesome *-* However, things arrive there much later than in other websites. Merchant username/website: Sarah Brave. She own a secret group on Facebook where she sells Japan-only items. Comments: Fast shipping and Sarah is a very nice girl! =D Totally worth it! I don't know T.T I'll ask Brit! @Small Lady, do you know? You need to find the specific post number by hovering above the Quote/Edit post button on the post in question. You should be able to see a number in the URL (for example for Mi's post above that number is 304612. So you just add that with a hashtag at the end of the main thread URL. I know I didn't think it was a post doing exactly what I was doing because of the title... so maybe a combo of our titles? "where to buy sm goods from japan with reputable merchants"? Before I add this to the list, do you remember which seller on Amazon it came from? Was it directly from the Amazon Warehouse or from a separate business? Thanks! That is exactly what I was looking to do! P.S. Do you mind if I quote you on a few things from your guide for the master post? I could add AmiAmi and some of the others that you mentioned. Item(s) purchased: Sailor Chibi Moon plush doll, PROPLICA Cutie Moon Rod, PROPLICA Crystal Star, Sailor Moon Crystal 2015 desk calendar, Miniaturely Tablet (set 1) 10 pack, Miniaturely Tablet (set 2) 10 pack, and more. Comments: I have ordered from AmiAmi for many years for both anime goods and doll-related items. I like their ordering system--it's very automated. I know right away if my order was placed or not, or if an item is sold out. I'm sure it happens, but so far I have not received a dreaded "sorry, this item is not available" email after successfully placing an order. AmiAmi allows you to combine orders placed at different times (based on product release date), allowing you to save on shipping costs. They offer a number of shipping methods; I always stick to EMS for fast delivery and insurance. Everything I have received from AmiAmi was packaged very safely and came with a card including instructions on how to report damage or issues. I have never had to do this, because my items arrived intact. I enjoy their service and will continue to order. Comments: I ordered the international release version of the PROPLICA Moon Stick from Crunchyroll's store in 2014. (The international release version is identical the Japanese release version, but comes with a printout of English-translated instructions.) Placing the order was easy and keeping tabs on order fulfillment was simple. My item was shipped appropriately and arrived well-packaged. However, my Moon Stick was defective--the lights and sounds did not work correctly. I asked Crunchyroll to replace my defective Moon Stick or refund my money--and they did. I will say that sometimes it took a day or two to get a response from customer service once I initiated my complaint. I remained polite, but insistent on what would be needed to resolve my issue (new working Moon Stick or full refund). It took just under 3 weeks to answer customer service's questions and receive a replacement product. Overall, I am a satisfied customer and would order again. Comments: Mandarake is a second-hand consignment store. People come to their store with used or unused anime- and hobby-related items to sell with prices in mind, and Mandarake sells those goods. They have a number of physical stores in Japan and one online webshop that lists an assortment of items from the physical stores. Mandarake is an excellent place to find 90s Sailor Moon merchandise. You can search in English or Japanese, but you will get more results if you search in Japanese. Because these items are in physical stores AND online, sometimes your order will be cancelled if the item was sold before your order was received. They allow you to specify, when placing your order, if there are any items that are so important that if you cannot have those items you want to cancel the entire order. These are not new retail goods, so it is important to read the item descriptions and ratings, as well as looking at the pictures. They sell 18+ items, so please be aware of this when searching. Their shipping options are standard, although I only have experience with EMS. My parcels have always been shipped promptly and arrived well-packed. I have never had an issue with an order. You can't purchase this but it's SUPER rare!! You should check this out! also, I'd like to point out that I've already bought from the Crunchyroll store and my Princess Petit Chara cahem without box! absolutely! i can put together better lists of what i bought from where, as well! Alright! I added your comment to the section on CrunchyRoll. Thank you, everybody for providing reviews for the places from where you have purchased items. I have added all of the reviews to the top post so that others may easily locate them. This is a really great thread! I'd like to note that I preordered the Princess Serenity Petit Chara from CrunchyRoll and she came with everything... Sorry yours didn't Mi. Do you think it was tampered with since you had to ship it internationally? I thought I would add to this list since I recently ordered from CircleRed in July. I must say, I was quite impressed with their pricing. A lot of the GE animation items are well below merchant retail price and the latest Japanese imports were way cheaper than a lot of other webshops. For example, the Petite chara set was only 39.99 USD when I pre-ordered it. Everywhere else was at least 10-20 USD more expensive. (However, the price on Circle Red has since gone up to 50 some USD, so it is always good to jump on CircleRed pre-orders. ) When you pre-order an item, you do not have to pay for anything until the items are actually in stock. Sometimes your Paypal invoice will expire before the item becomes available, but there is nothing to worry about because the store will send you a new one once they are ready to prepare your shipment. Note: if you purchase multiple items and do not specify if you want the items shipped together or separately, they will automatically wait until everything is in stock. In my case, I placed an order the first week of July, but didn't get any of my items until the second week of September because that was when the 2nd batch of Petite Chara pre-orders arrived to the store. Once the shipment arrived, the actual parcel made it to my house two days later because they shipped it with 2(? )-day priority. The way they packaged the items within the box was absolutely beautiful, especially for collectors who like to keep character merchandise in mint condition. 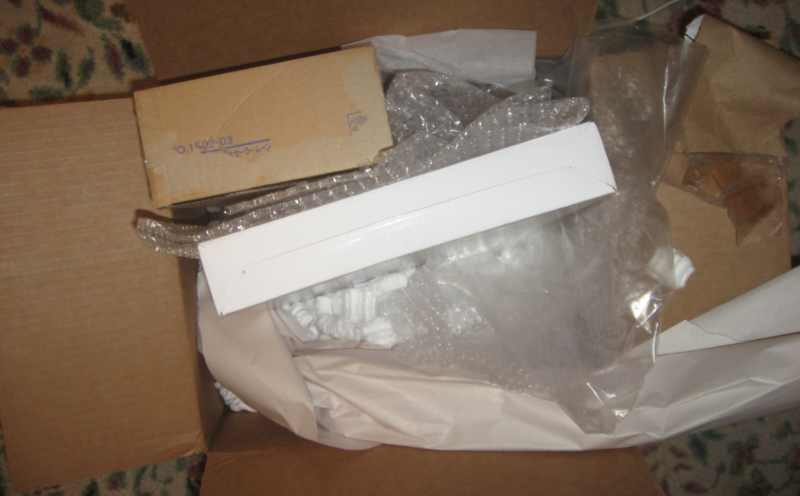 Every item was kept in its factory sealed shipment/cardboard box or plastic and was wrapped carefully in paper and bubble wrap with lots of packing peanuts. I decided to take a picture, but after I had already torn everything open. As far as communication goes, customer support was pretty good, especially when it came to answering questions regarding pre-orders and your order status. I had a few problems at the beginning, but I think it was my spam filter because I started receiving responses to my inquiries after I added their customer service e-mail to my address book. Oooh wow! Thanks for sharing the site. They have a lot of the GE stuff that I haven't seen on Amazon or in stores. I think they directly order from GE on demand because I was able to get the Sailor Moon S binder for retail price, which for some reason, people keep selling on Ebay and Amazon for 45USD (super not worth it as the binder isn't any more than really strong cardboard). :/ I don't think it's out of print. Item(s) purchased: I have not personally made an order, but I have heard wonderful things from reliable sources about this website. I will likely make a purchase in future and will update my review at that time. Comments: I've found Aitai Kuji extremely reasonably priced. They're able to give access to goods that would otherwise have to be purchased through a deputy service or resident of Japan. They don't carry everything, but they do have items that are difficult to purchase; for example: the Universal Studios Japan Cutie Rod which requires admission to the park itself, or lottery items which often are not purchasable by most deputy services. Sometimes you can purchase the actual item, other times you can purchase a ticket to the lottery itself. They also take pre-orders. In the past, they've had several Sailor Moon cafe items, USJ items, and lotteries.